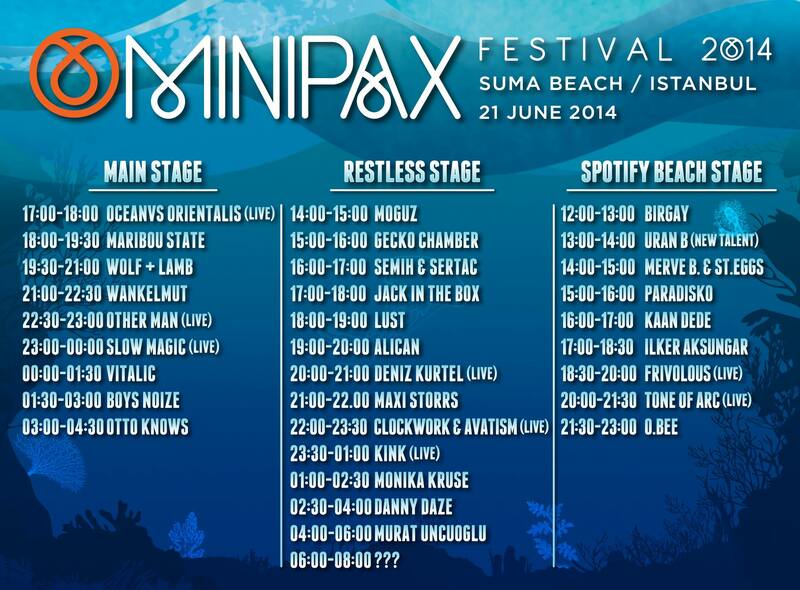 Suma Beach is already one of our favourite spots around Istanbul to escape from the metropolitan rush. Not only the 6,000 sqm sandy beach appeals to us but also the exceptional line-up. On Saturday, 21 June 2014, however, the NewSpeak crew adds an extra portion of musical variety and offers you the opportunity to embark on 20hrs journey at three stages to explore the different shades of House, Techno, Electro and everything in between. The main stage will be warmed up by Brooklyn’s finest Wolf+Lamb who kicked off a huge movement of soulful, low-BPM House with their eponymous imprint. Alexander Ridha alias Boys Noize was also long time ago a safe House wax selector at Hamburg’s Underground Solution record store and continued later a more Electro-influenced path with his own label Boys Noize Records. The Restless Stage is the right address for you if you are full of energy. Moguz who recently stood out with a remix duty together with Baris K. (Aboov Plak) for Sezen Aksu and Kasette’s Semih & Sertac will bring you into the groove while Turkey’s most shimmering electronic music lady catch you with her hypnotic melodies around sunset. The Milanese duo Clockwork and Avatism will show you their dark definition of Techno while Sofia’s Acid King Kink astonishes you with an exceptional live improvisation as he recently did at Pete Tong’s Essential Mix. Miami Boy Danny Daze is playing raves since he is 13, so be prepared for a syncopated drum show heavily-influenced by Electro and Detroit Techno. For those of you with swimming suits, the Spotify Beach Stage may be the right address for laid-back, deep and Disco-influenced grooves. 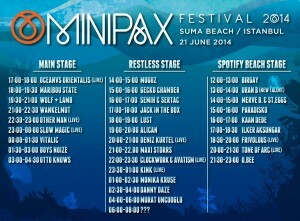 Don’t miss Istanbul’s freshest festival MiniPax 2014.